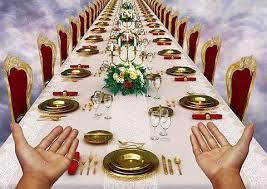 One of the most glorious anticipated events to come is the marriage supper of the Lamb. Imagine a perfect supper with all the settings and pure atmosphere (no trace of sin around). But this subject is not often looked into and there is even some confusion about it. Let us look at it from Inspiration. What is the marriage spoken of in “Christ’s Object Lessons,” p. 307, and in “The Great Controversy,” pg. 426, 427? In one instance, it is said to be “the union of humanity with divinity”; in another “the reception by Christ of His kingdom” in still another it is said that the marriage “takes place in heaven, while [the saints] are upon the earth” waiting “for their Lord, when He will return from the wedding.” Will you please clear this complex subject for me? Let us remember that these figures of speech, along with many others, are only illustrations of truths, not the truths in themselves. For example, the setting up of the Kingdom is illustrated, in one instance, by the “harvest;” the subjects of the Kingdom, by the “wheat”; and the kingdom itself, by the “barn.” Matt. 13:30. So, while it is true that the marriage of Christ is a “union of humanity with divinity,” it is also true that the marriage is “the reception of His kingdom,” for humanity makes up the Kingdom. Therefore, the marriage is equivalent to the coronation; the Kingdom itself, to the city, or bride; and the guests, to the saints or subjects of the Kingdom. From this we see that when Christ receives His Kingdom, He indeed will unite humanity with divinity. The reception of His Kingdom takes place in heaven while the saints are still on earth, as Daniel was shown: “I saw in the night visions, and, behold, one like the Son of man came with the clouds of heaven, and came to the Ancient of days, and they brought Him near before Him. And there was given Him dominion, and glory, and a kingdom, that all people, nations, and languages, should serve Him: His dominion is an everlasting dominion, which shall not pass away, and His kingdom that which shall not be destroyed.” Dan. 7:13, 14. Bringing into prophetic focus this same event Jesus declared parabolically: “A certain nobleman went into a far country to receive for Himself a kingdom, and to return.” Luke 19:12. Note that He receives the Kingdom (acquires ownership of it) while He is away, not when He returns. (See The Great Controversy, pp. 426, 427). Consequently, though the wedding takes place in heaven, the saints while on the earth are the prospective guests for the marriage supper. Then, after the marriage is solemnized in the Holy of Holies, Jesus descends from heaven and takes the guests unto Himself, so that where He is, they may be also (John 14:1-3). There they eat of the “marriage supper of the Lamb.”–The Great Controversy p. 427; Rev. 19:9. In this instance, while the saints are said to be the guests, the Holy City is said to be “the bride.” Rev. 21:9, 10. Again: just before the marriage, when the saints are still on earth, their righteousness is said to be the bride’s (city’s) “fine linen.” Rev. 19:8. “They will question and criticize everything that arises in the unfolding of truth, criticize the work and position of others, criticize every branch of the work in which they have not themselves a part. They will feed upon the errors and mistakes and faults of others, “until,” said the angel, “the Lord Jesus shall rise up from His mediatorial work in the heavenly sanctuary and shall clothe Himself with the garments of vengeance and surprise them at their unholy feast, and they will find themselves unprepared for the marriage supper of the Lamb.” Their taste has been so perverted that they would be inclined to criticize even the table of the Lord in His kingdom”(Testimonies, vol.5, p.690). “The guests at the marriage feast were inspected by the king. Only those were accepted who had obeyed his requirements and put on the wedding garment. So it is with the guests at the gospel feast. All must pass the scrutiny of the great King, and only those are received who have put on the robe of Christ’s righteousness. So let us often think about our end goal, to be with the King and our beloved relatives and friends in that precious marriage supper table. We want to be there and we will indeed be married with the King for eternity–wow! This entry was posted on September 10, 2016 at 4:31 am and is filed under Our Lord's kingdom. You can follow any responses to this entry through the RSS 2.0 feed. You can leave a response, or trackback from your own site.